This article was originally published on June 26, 2018 by Johns Hopkins Medicine’s News & Publications. The PICU Up!™ program has intensive care patients, regardless of their medical status, out of bed and moving sooner. After 4-year-old Avery Doehne was diagnosed with heart failure in February this year, she was admitted to the pediatric intensive care unit (PICU) at Johns Hopkins Children’s Center and placed on the heart transplant list. To prepare for that eventual surgery, she would need to find ways to reclaim her strength, which is no easy undertaking in an intensive care setting. Traditionally, pediatric ICUs heavily sedate children to treat their pain and protect them from the stressors of an intensive care environment. 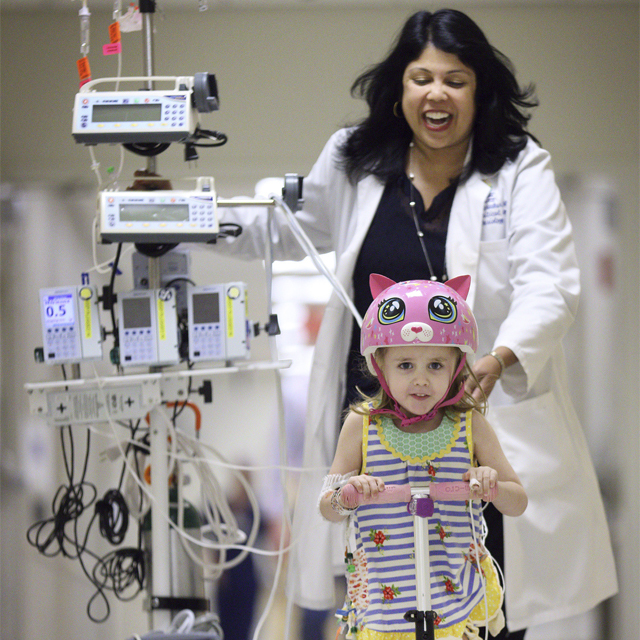 Noticing the success that critical care colleagues in the adult ICU had in mobilizing patients early, Kudchadkar and nurse practitioner Beth Wieczorek set out to do the same for children in the PICU. Initially, they were met with skepticism. Parlaying the multispecialty nature of care in the PICU, Kudchadkar and Wieczorek began by pulling together specialists from every discipline—from medicine to surgery to physical and occupational therapy—to discuss the issues and barriers regarding early mobility for children in intensive care. Their goal—for all patients regardless of medical status—was to start mobilization therapy as early as safely possible, before the child gets better. To do so, they developed a three-level activity plan tailored to each child’s physical limitations. Did they? Now during morning rounds in the intensive care unit, staff members discuss the PICU Up!™ level of each patient and his or her mobilization goals for the day. Rather than wait until Day Five or Day Seven to get the physical therapist to the bedside, as was the custom in the past, the therapist shows up by Day Three. Nurses are active in the program, too, learning from the therapists about the benefits of early mobilization and taking on new empowering roles. There are data in addition to the anecdotal evidence. 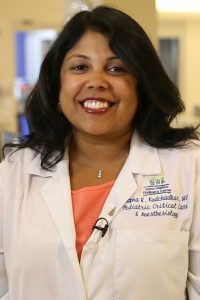 In a pilot study, Kudchadkar recruited 100 children ages 1 day through 17 years who were admitted to the Johns Hopkins PICU for at least three days. In the baseline comparison, 465 mobilization activities among the children were recorded, and 769 after the program. The proportion of children having at least one in-bed activity increased from 70 to 98 percent, and the proportion of children who walked by Day Three increased from 15 to 27 percent. The median number of mobilizations per patient by Day Three in the PICU doubled from three to six. Of the 39 orally intubated children, none walked prior to PICU Up!™ implementation, compared to four out of 40 orally intubated children who walked afterward. The program also resulted in higher rates of physical and occupational therapy consultations from 54 to 66 percent and 44 to 59 percent, respectively (Pediatric Critical Care Medicine 2016 Dec;17(12):e559-e566). Kudchadkar is conducting related research studies, including a multi-site study of rehabilitation practices in 72 pediatric ICUs in the United States. The study, called PARK-PICU, is also being adapted internationally in Canada, Europe and Brazil. In addition, Kudchadkar is tweeting about the program and presenting its benefits at various Grand Rounds and critical care conferences. Evidence of the initiative’s success is visible in the halls of the Johns Hopkins PICU. A heart transplant patient did not want to walk two days after his surgery until another patient talked him into it. Now both kids loop the unit two or three times daily. A toddler with a breathing tube who had a tracheostomy is sitting up in a chair playing with blocks. In the past, this child would have been immobile in bed. And young heart patient Avery?